Rick, a U.S. Army Veteran, was working for a printing company, preparing one of the press machines to run off another batch of forms, when a rubber band hit him in the ear. He turned around to see a colleague, horsing around, with a big smile on his face. Suddenly, everything that Rick had been trying to push down and bury for 35 years started to bubble up. There were about 20 printing presses in the building, and the yelling got so loud that everyone shut them down. He threw the card on the ground and walked out. When Rick got home that day, his wife called his kids. “Dad,” they told him, “you need to go get some help.” They told him they had known something was wrong for a long time. His quick temper. The way he would always check the doors. The way he would always look out the windows. Decades before, at the age of 18, Rick deployed to Vietnam. Shortly after arriving, he flew out to a firebase in a helicopter. As he stepped off, two medics placed a body bag on the chopper in his place. 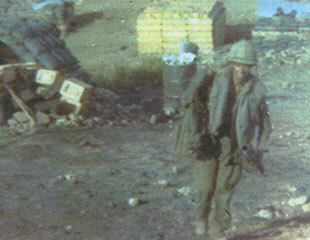 A couple of weeks later, the base came under heavy fire, and another soldier was killed. When Rick finally returned to the United States after a bout with malaria, he fell to his knees and kissed the tarmac. But while walking through the airport, anti-war protestors yelled and spit at him. The moment just added to an experience that would continue to haunt him for decades to come. Rick “self-medicated” with drugs and alcohol. He withdrew from his friends and family. He avoided crowds and loud noises. Eventually, he moved to San Diego, joined an apprenticeship program through VA, and buried himself in his work as a printer. Those feelings remained buried until that day Rick blew up. And his wife called his kids. And he made the decision to return to VA.
Rick saw a psychiatrist, entered a substance abuse program, and attended classes for coping with PTSD. He found strength in group therapy sessions with fellow Veterans. To this day, Rick faithfully attends a group session every Tuesday with Veterans from across several generations. There are Vietnam Veterans, Korean Veterans, and at one point, even two Veterans from World War II. Rick continues to face health challenges and the effects of exposure to Agent Orange. He has been treated for prostate cancer, E. coli, pneumonia, and a bad rash on his back. But he keeps his focus on his family — his three kids, nine grandchildren, and three great-grandchildren (with another on the way). He stays active with military and Veterans organizations like the VFW, Vietnam Veterans of America, and Disabled American Veterans. He’s a member of the 82nd Airborne Honor Guard, helping with the 21-gun salute at funerals. And he speaks at high schools, educating a new generation about the Vietnam War. Rick has found healing in these experiences. “I think about all my grandkids. I want them to be proud of their grandfather, and show them that I am a warrior and that I can overcome,” Rick says. “You can overcome anything you want to if you put your mind to it. It’s you that can step up to the plate and have the responsibility to make your way, and that’s what I did.